‘Floods of 1897 and 1928 inundated this area – the flooding in1897 was called The Great Flood and attributed to a record high tide on 29th November’. 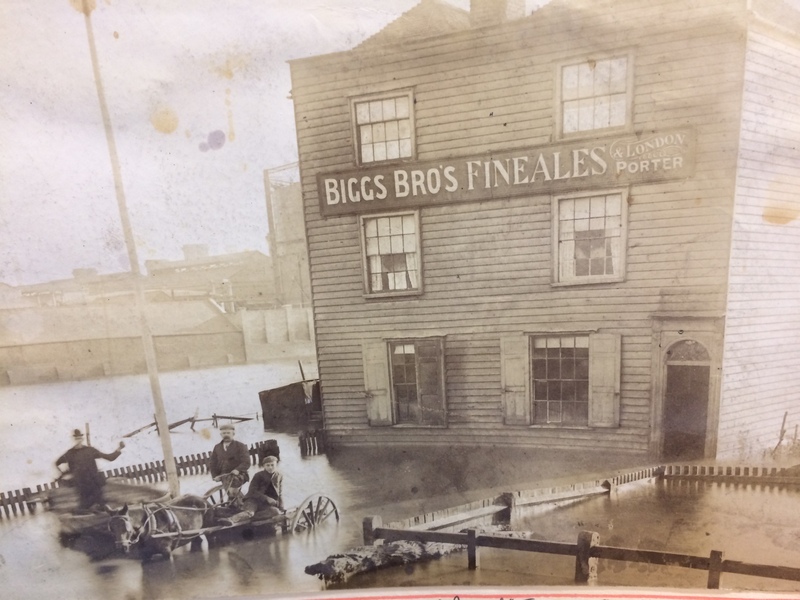 The image below shows the Homeward Bound Public House inundated by the flood waters. The Gas Holders of the Gasworks, can be seen in the background. The Gasworks, on Gas House Way was one of the earliest built in the UK in 1818. The area was known as Gas House Marshes. Image by kind permission of Medway Archives and Local Studies Centre. CAST IRON UNIT ‘BRICKIES‘ STACKIES STUMPIES’. You can also add MUDDIES to this list as well! All colloquial names for the trades associated with Medway Barges built in and operating out of the Rochester Riverside site. Brickies carried up to 40,000 bricks on the up river journey to London and came back laden with London’s rubbish. Stackies were piled high with Hay and Straw. Stumpies could take cement, lime, timber, clay, coal, bricks, hops and other commodities. Muddies are self explanatory…the carried clay and mud dug from the banks of the Medway Estuary and destined for local brickworks. CAST IRON UNIT ‘GOLDEN SAMPHIRE’. ‘To the northwest the Medway Estuary consists of an extensive area of marshland, comprising of salt marsh and intertidal mudflats. The River remains tidal at this point and estuarine conditions would have dominated most of the site’s past.’ Ref: KCC HER 012. 2014 -371. Golden Samphire grows on estuary mudflats and salt march. It is rare and I have used it as it represents the efforts being made by the client team to build upon the heritage and legacy of the natural environment with it’s diverse flora and fauna. Blue Boar Creek is the one of the more distinctively named and well remembered places on our site. It also gave name to Blue Boar Lane, Blue Boar Hard, Blue Boar Lower Yard, Blue Boar Upper Yard, Blue Boar Lane Foundry and Blue Boar Pier. 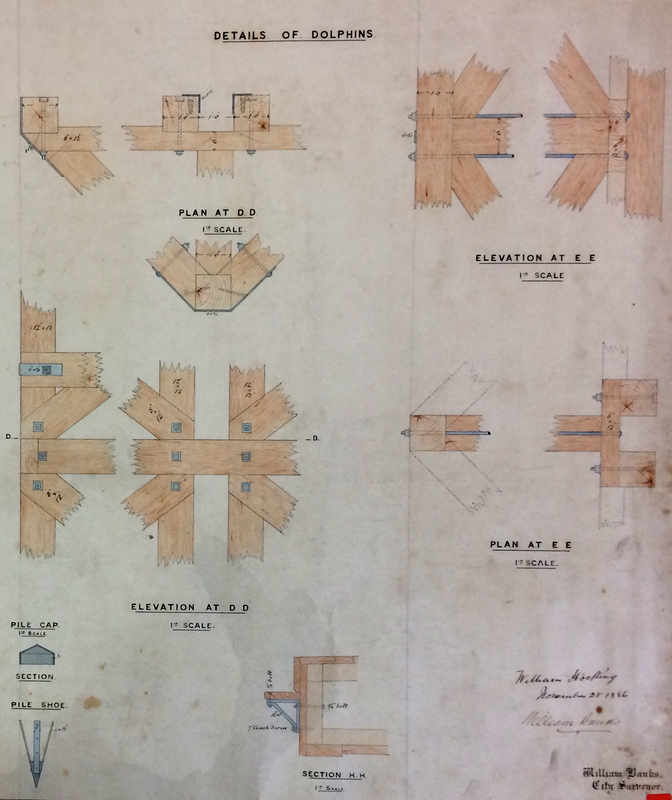 ‘Blue Boar Hard Pier: November 26th 1886′ as seen at the Medway Archives is set of beautiful, hand painted drawings of plans for a new Pier by draughtsman William Hoelking. Some details are referred to as ‘DOLPHINS’ & ‘DUMMY’. MALSC Ref: Plan 1 of 4 (002) MP/B/30/1 (1 of 4). Blue Boar Hard Pier: November 26th 1886. Image: By kind permission of MALSC. Ref: Plan 1 of 4 (002) MP/B/30/1 (1 of 4). William Banks City Surveyor has also signed this document. William was born in about 1850 at Edmonton. He married Anne Mary Everett in June 1876 at Islington. In 1891, he and his family were living at at 10 Albany Road, Rochester, William was by then aged 40 and a surveyor for the city of Rochester. ‘What is now left of Blue Boar Creek and the river beyond at Limehouse Reach, lies deathly silent. Coal is not longer unloaded from colliers at Cory’s Wharf. So too is the Pier, once festooned with skiffs and rowing boats, where formerly small boys with rod and line and a jar of worms could fish away the school holidays’. John K. Austin from his publication ‘Yesterday’s Medway’. Johns has been involved with this project from the outset, having been consulted by the project Architects BPTW on his local knowledge as a historian, author, teacher and artist. GRANITE UNIT ‘THE FIVE BROTHERS’ William Higham had a Barge Building business on Blue Boar Hard. He was born in 1838 in Lewes Sussex. On 27th October 1864 he married Fanny Elizabeth Blake in Strood. By 1881 they had 9 children and lived in a private house on Victoria Street, Rochester. William employed 11 men and 7 boys. THE FIVE BROTHERS was the last barge built at this yard alongside DOROTHY in 1901. GRANITE UNIT ‘PERENNIAL GLASSWORT’. ‘The Medway Estuary is believed to be the most important area in North kent for wintering wildfowl in numbers of international significance. The saltmarsh serves as a roosting area for waders at high tide. Several scarce plant species include: golden samphire, perennial glasswort and one-flowered glasswort. The estuary is one of the best places in Britain for the study of glassworts. The grazing marsh has breeding and wintering birds of interest; the former include lapwing, redshank, pochard, mallard and gadwall, while in winter large flocks of may wildfowl and wader species are present.’ Ref: Environmental Stresses and Resource Use in Coastal Urban and Peri Urban Regions. DPSIR Approach to SECOA’s 17 Case Studies. GRANITE UNIT ‘COAL: METER HEAVER WHIPPER’. Colloquial names for trades employed in the Coal business.Frederick Furrell was born in 1807 and died in 1877. Frederick Furrell & Son were Coal Merchants based at Furrell’s Wharf, a He was also an Alderman & Shipowner. He had ten children with his wife Katherine who he had married on February 25th 1832 at St Margaret’s Church in Rochester. Fred was Mayor of Rochester in 1855. Furrell’s Wharf was a 30m length of post and plank revetment of Oak and Elm Posts, most likely made from re-used ships timbers was in use in 1865 making it one of the oldest sites for industry on Rochester Riverside. It was accessed via Furrell’s Road. Coal was a major industry at Rochester, with several businesses engaged, most notable William Cory & Son of Fenchurch Street London were registered in 1896 after taking over he business of coal factors, merchants and Lightermen of William Cory & Son of Rochester at Rochester Coal Wharf.